Painters: Roger Anliker, Noah Buchanan, Eduardo Carrillo, Russell Chatham, Fred Dalkey, Martha Erlebacher, Charles Griffin Farr, Christine Hanlon, Eric Holzman, Andrea Johnson, David Ligare, Peter Loftus, Jennie McDade, Jim McVicker, David Molesky, John Moore, Graham Nickson, Charles Schmidt, Helen Miranda Wilson and Jack Zajac. "Intimate Landscape" concerns the landscape as a matter of individual experience rather than panoramas or "sublime" landscapes. The works in this exhibition share an intensity of connection between the artist and the landscape, often for very personal or circumstantial reasons. Many works have a subtle and unconscious quality of autobiography. Other paintings emphasize the role of the artist's imagination in negotiating unique interplays between internal experience and the enveloping world. Laura Parker is a nationally and internationally known installation artist that has been working in the realm of food and agricultural art for over 20 years. In 2000, Parker realized that the farmer and the foods they grow, are generally dismissed by the public until their work is re-envisioned by someone else, either artist or chef. From this point, Parker began a journey with a body of work called Landscape: The Farmer as Artist and evolving into Taste of Place. This installation will be shown at the Sesnon Gallery December 6 – January 28, 2007 (closed for winter break December 17 – January 2). Taste of Place promotes awareness of the farmer as artist and the value of farmlands and open spaces. The artist will host a “Soil Tasting” event during the opening reception on Wednesday, January 10 between 5:00­–7:00pm in the gallery and on January 24 in collaboration with the UCSC Farm and Garden from 3:00–5:00pm. 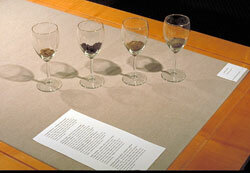 What is a soil tasting? Soil, the medium of every farmer, makes up the palette that creates the distinction among growers. It differentiates between farms; between the family farmer and agribusiness, sustainable practices and commercial ones. The purpose of this installation is to ask two questions: How does soil touch our lives and affect our food; and why does it matter? Taste of Place is meant to stimulate public dialogue about food production. 1. Smell the soil, develop impressions. 2. Taste food in its most basic form and attempt comparisons. You will be served soils from the participating farms. First you will stimulate the soil by adding a small amount of water and stirring to release the earth’s scent as if from a fresh rain. 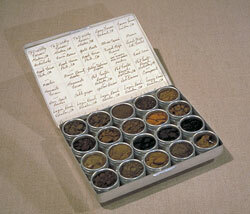 Then you will smell, identify the scents you recognize, and note their properties. You will then be served food grown in the same soil you have just smelled. See if you can taste the same properties in the food. Note your reactions and experiences. Am I expected to eat dirt? No, you will taste the food grown in the soil and through that experience the taste of the soil.